A new and different colour in Scyscraper Lilies. 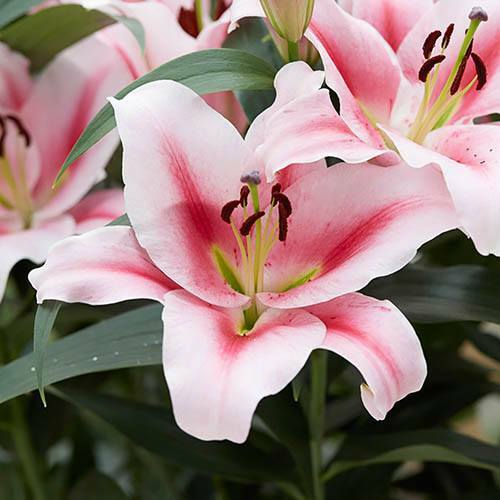 New for 2019 and not available to buy anywhere else, this collection of fabulously scented, two-tone lilies produces huge pale-pink blooms blushed with a darker centre stripe along each petal. Dubbed 'Super Lilies', Lilium 'Frontera' is a new and exciting colour for Skyscrapers and will grow so tall they look like trees! These large Skyscraper Lilies are part of a select group of hybrids that have recently been bred by crossing oriental and trumpet lilies, giving them characteristics of both, including flowers which can measure well over 15cm (6in) across. Each and every flower will give off a heady perfume with each individual stem carrying well over 20 blooms - perfect for cutting too if you want to create your own flower arrangements indoors. Supplied as 5 top-sized bulbs. Flowers from June until September. Height approx. 1.5m (5ft). Plant 10cm deep and 15cm apart. New for 2019 and not available to buy anywhere else, this collection of fabulously scented, two-tone lilies comprises of 5 commercial-grower quality, top-sized bulbs producing huge pale pink blooms blushed with a darker centre stripe along each petal. Dubbed 'Super Lilies', Lilium 'Frontera' is a new and exciting colour for Skyscrapers and will grow so tall they look like trees! In their first year they will reach up to 1.5m (5ft) tall, but in future years, once they are fully established, they will get even taller up to 6 or even 7 foot tall eventually! These large Skyscraper Lilies are part of a select group of hybrids that have recently been bred by crossing oriental and trumpet lilies, giving them characteristics of both, including flowers which can measure well over 15cm (6in) across. Fortunately, this breeding has not diminished their scent, and each and every flower will give off a heady perfume with each individual stem carrying well over 20 blooms - perfect for cutting too if you want to create your own flower arrangements indoors. Grow all 5 in large pots about 15cm apart, or in groups in garden borders. They have very strong stems, so should not need support - although if your garden is exposed, it is recommended. Cut them for the long-lasting displays in the vase or leave them to marvel at in your garden. Allow them to die down naturally after flowering, and they will build up reserves for even bigger and better displays the following year. Fully winter hardy, they will last for many years. Plant lilies as soon as possible after receipt, so that they don’t dry out. When planting, handle them gently to avoid breaking off the scales. Lilies can be planted at any time from early autumn, to mid-spring. Planting in autumn often helps them settle in and become better established before they start to put on their new spring growth, but spring planting is a better option if your soil is heavy and wet during winter. Choose a sunny spot, preferably where the plant receives a little light shade at its base and plant each bulb 15-20cm (6-8in) deep in a well-drained soil, enriched with well-rotted organic matter or leaf mould. Space them at 30cm intervals and provide support before the flowers appear. Deadhead the faded blooms promptly and cut the dead stems back to ground level at the end of autumn. Please note that as with other lilies, all parts are reported as being toxic to cats and care should be taken.